The black bear that recently visited a residence near campus reminded me how fortunate we are that the black bear is UCA’s mascot. 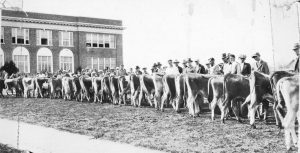 As many of you know, UCA did not have a mascot until 1920. Before then, sports writers referred to our athletic teams as, Tutors, Teachers, Normalites, The Normal Eleven, Pea Pickers and Pedagogues. Below you will find an article that was written when sports writers called us The Pedagogues. GO BEARS, sounds much more appropriate than GO PEDAGOGUES!! The fall of 1918 was much different than previous fall semesters at Arkansas State Normal School (now the University of Central Arkansas). There were very few men on campus, and men’s sports were canceled for the fall. 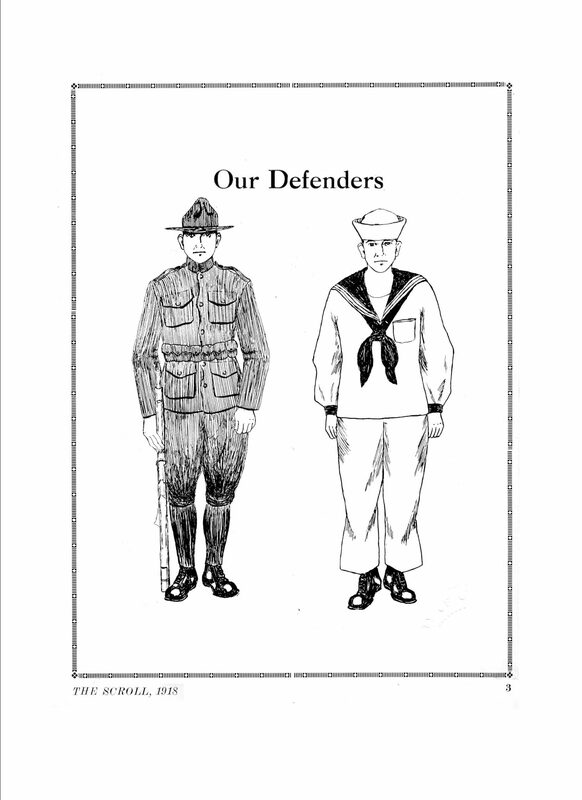 The men were involved in the Great War, later known as World War I. 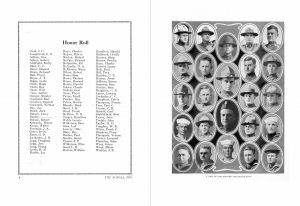 There were 200 men enrolled at the Normal in spring 1917, but only 12 men were enrolled in classes in the spring of 1918. 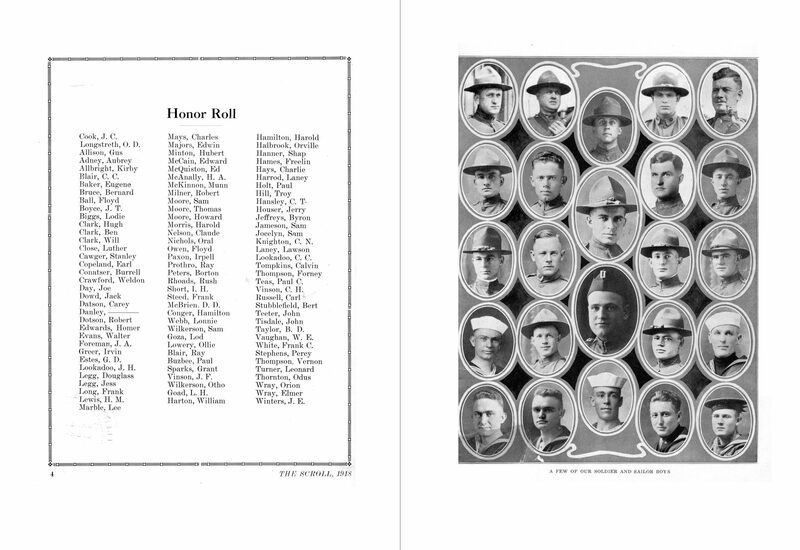 During the fall of 1918, there were approximately 18 men enrolled. 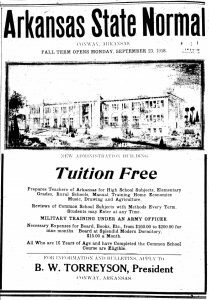 The 1918 ASNS Bulletin reads a little differently, but there is still no charge for tuition, for in state students. Listed under the heading “Expenses” the library and incidental fees are $8.00, laboratory fee of $3.00, and text books were estimated to cost $8.00. 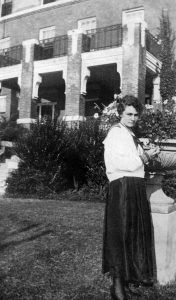 Room and board for women living in Doyne Hall was $15.00 per month, and room and board with most Conway residents ranged from $18.00 to $20.00 monthly. Though tuition was not charged to Arkansas residents, it was charged to out of state students. Out of state students were required to pay tuition at the rate of $3.00 per month. 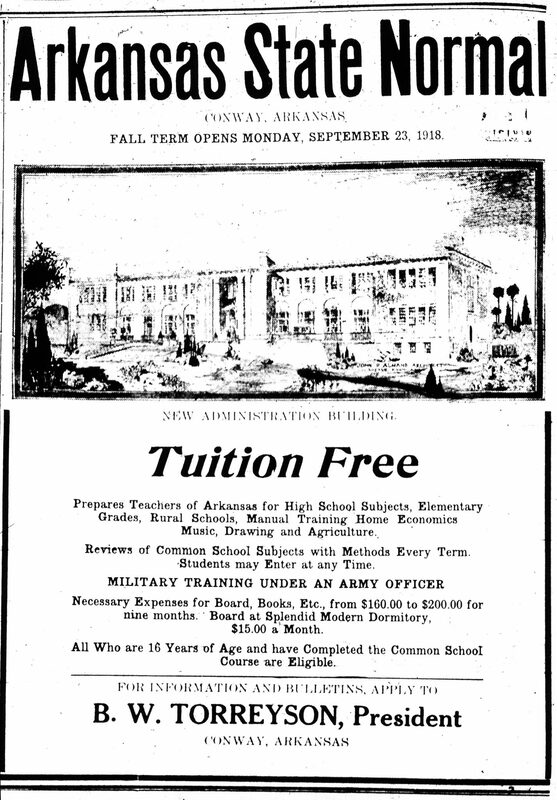 The 1918 ASNS Bulletin made the first mention of out of state tuition. 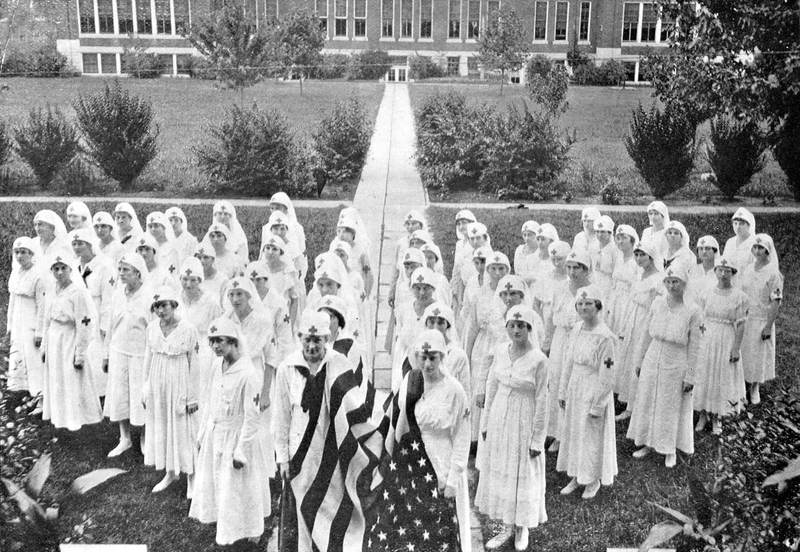 Due to the Spanish influenza pandemic that swept the nation and state, ASNS students were given the option of leaving ASNS during the first week of December, and not returning until after the holidays. Only about 40 students accepted this offer. It should be noted that some state supported institutions of higher education either began the fall semester late, or closed early, or did not open at all for the fall semester due to the outbreak of Spanish influenza. 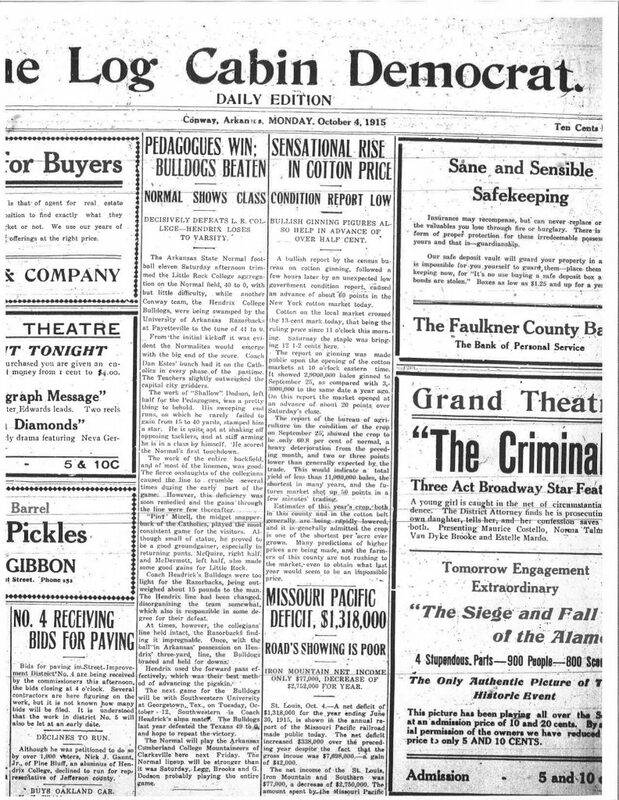 The news on campus in June 1918 primarily centered around the Normal summer school enrollment, the Faulkner County Teachers’ Institute that was held at the Normal, and a solar eclipse viewing that was held on the Normal campus. 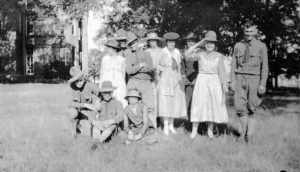 Summer School Enrollment: The enrollment for summer school students was a record for Arkansas State Normal School (now the University of Central Arkansas – UCA) in 1918. More than 200 students were enrolled. 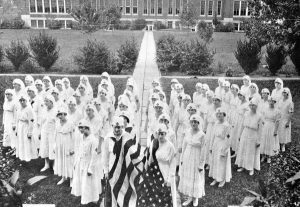 The enrollment would have been much larger had it not been for the war (later known as World War I) where most of the Normal male students were serving in a branch of the U.S. Armed Forces. The 1918 spring enrollment for men had suffered significantly. 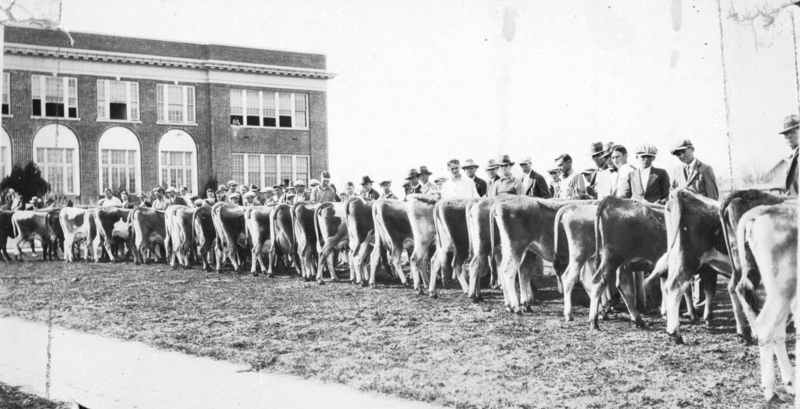 In the spring of 1917, there were 200 men enrolled, but by the spring of 1918, only 12 men were enrolled in classes. But nonetheless, the 1918 summer school enrollment was still the largest up to that time. 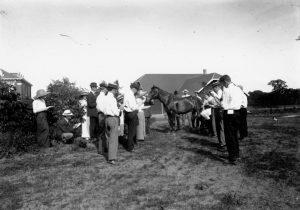 The reception that was given by the faculty for the incoming students was a tradition during those early days. The reception was held in the parlors of Doyne Hall, the dormitory for women, and the only dormitory on campus in 1918. Faulkner County Teachers’ Institute: During the summer of 1918, the Faulkner County Teachers’ Institute was held on the Normal campus. County teachers’ institutes were popular during that time period and were conducted to improve upon the relatively poor teaching credentials held by most Arkansas teachers. County teachers’ institutes were held in each county of the state and were attended for the most part by people actively engaged in the teaching profession. As most of you know, there were very few public school teachers who held the Licentiate of Instruction and an even smaller percentage who held Bachelors degrees during that time period. There were five levels of licenses that a teacher could hold in 1918. From the highest to the lowest, the licenses were: State; Professional; First Grade; Second Grade, Third Grade. This meant that the most qualified teachers, and possibly those who might hold a degree, held a State License or a Professional License. 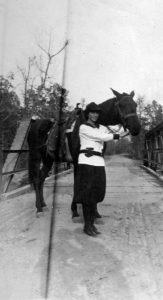 In Faulkner County, during the 1918-1919 academic year, there were 8 teachers who held a State License; 17 teachers held a Professional License; 118 teachers held a First Grade License; 89 teachers held a Second Grade License; 4 teachers held a Third Grade License. The statistics for teachers and the licenses they held, during the 1918-1919 academic year for the entire State of Arkansas were as follows: 300 teachers held a State License; 434 teachers held a Professional License; 5,750 teachers held a First Grade License; 3,521 teachers held a Second Grade License; 792 teachers held a Third Grade License. The Faulkner County Teachers’ Institute, was under the direction of O.L. 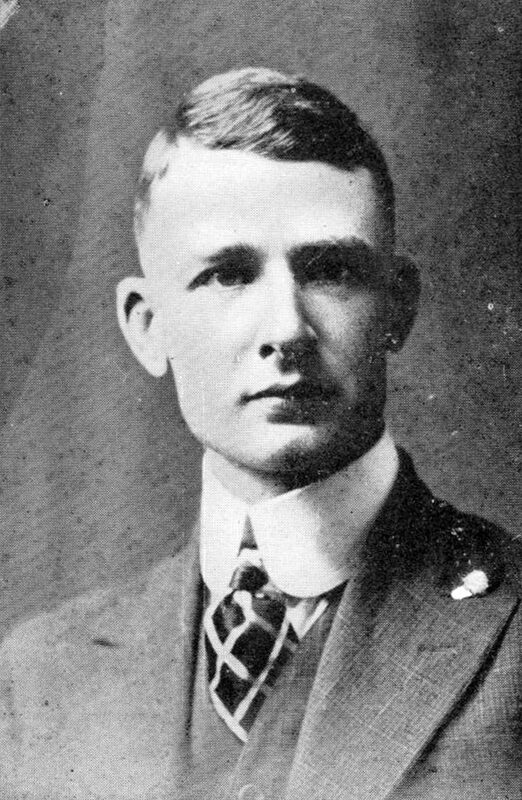 Dunaway, a Conway native, who at that time was the superintendent of the Hot Springs public schools. The Faulkner County Teachers’ Institute was one week in length, and Arkansas State Normal School professors taught classes in the Institute. The facilities for the Faulkner County Teachers’ Institute consisted of a large tent. According to The Log Cabin Democrat, “For the convenience of the teachers a large tent has been secured and will be erected on the Normal campus and under this the daily work will be conducted.” The tent was made necessary due to the large summer enrollment of Normal School students. More than 80 Faulkner County teachers attended the 1918 Faulkner County Teachers’ Institute. Solar Eclipse: Another interesting event that took place on the Normal campus was the viewing of a solar eclipse. The solar eclipse was on Saturday, June 8, 1918, and the Arkansas State Normal School Science Department helped visitors view the solar eclipse in a safe manner. Pieces of smoked glass were distributed to all those who wanted to view the eclipse, which began at 5:30 p.m. and by 6:30 p.m. had reached its maximum, which was 90 percent coverage. Longtime professor of science, E.E. Cordrey, was on hand to discuss the nature of eclipses. 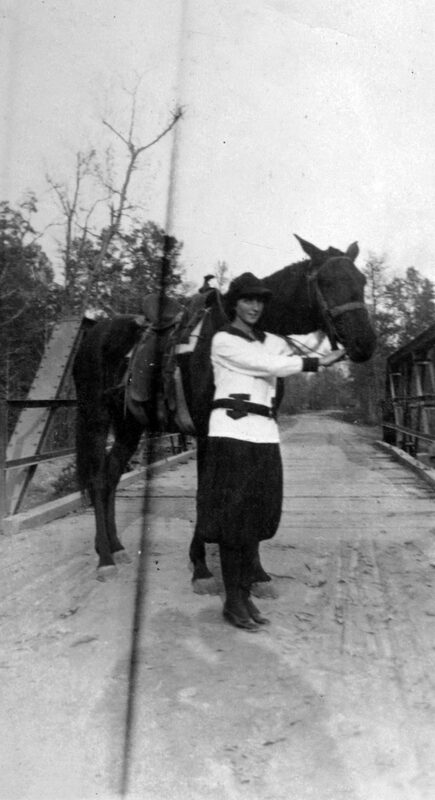 Attached are two photographs from 1918. The woman standing outside Doyne Hall, was Normal School student Mamie Munger. She was later known as Mrs. Tom Herrod. Her type of attire was typical for that time period. During World War II, enrollment at Arkansas State Teachers College (now the University of Central Arkansas – UCA) plummeted from 764 students in the fall of 1941, to 289 students during the 1943-1944 academic year. UCA President, Nolen Irby, had seen the steep decline in enrollment coming and had taken action to bring more people on campus. President Irby and UCA Board of Trustees chairman, George Bachelor, asked the U.S. War Department to use UCA as a temporary military base. 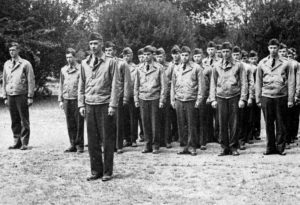 Soon, UCA was home to temporary branches of the Women’s Army Corps, Army Air Corps Cadets, Navy Cadets, Marine Corps Reserve and Navy Reserve. 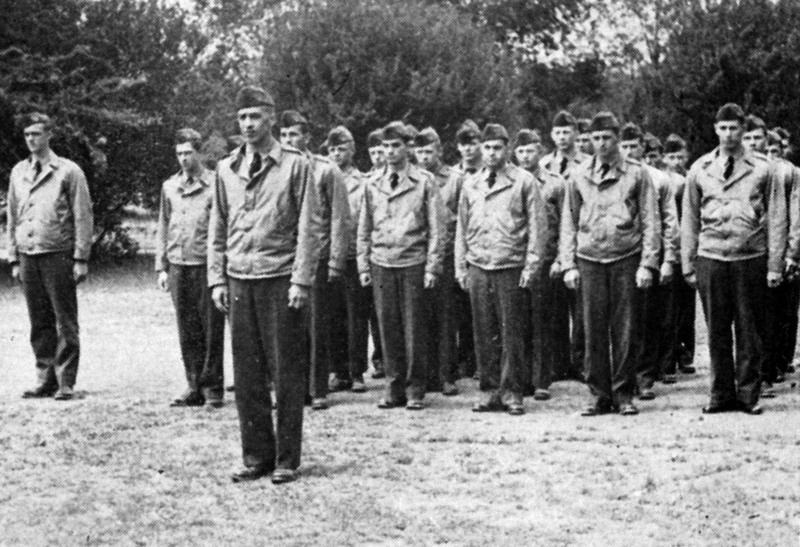 For a short time UCA was also the headquarters of the Arkansas National Guard. 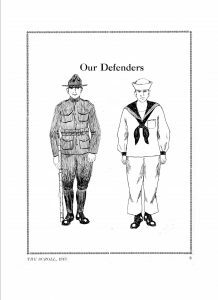 Today we will focus on the Navy Cadets. Two photographs are attached, and one of those photographs show the Navy pilots standing by their airplanes. 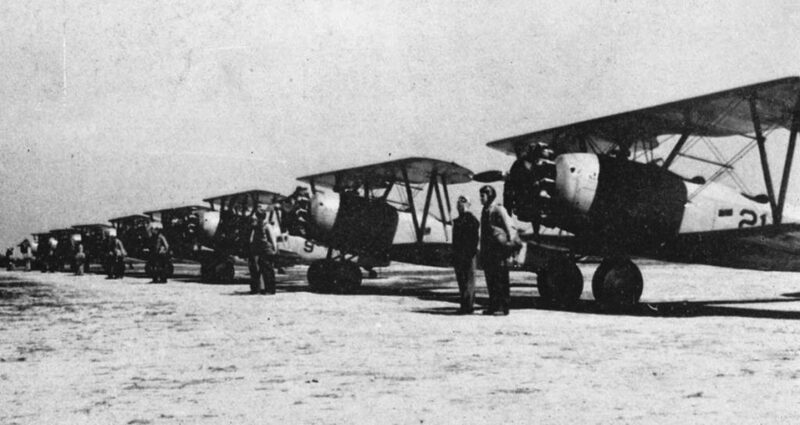 The Navy trainer was the N3N Yellow Peril. The other photograph is Third Platoon, a group of inexperienced Navy Cadets. In regard to the Navy trainer, the N3N Yellow Peril, the following information will help to explain the reason for the airplane’s name. Navy Cadets at UCA took their classroom instruction from UCA professors. The professors covered courses in navigation, engines, aerology, communications and civil air regulations and recognition. According to records compiled by the federal government, UCA did a good job of training pilots. Out of 85 colleges in the U.S. involved in military training, UCA ranked seventh overall. In aviation and ship recognition, UCA was first in the nation, and third in the nation in navigation. Approximately 500 Navy pilots were trained at UCA during World War II. 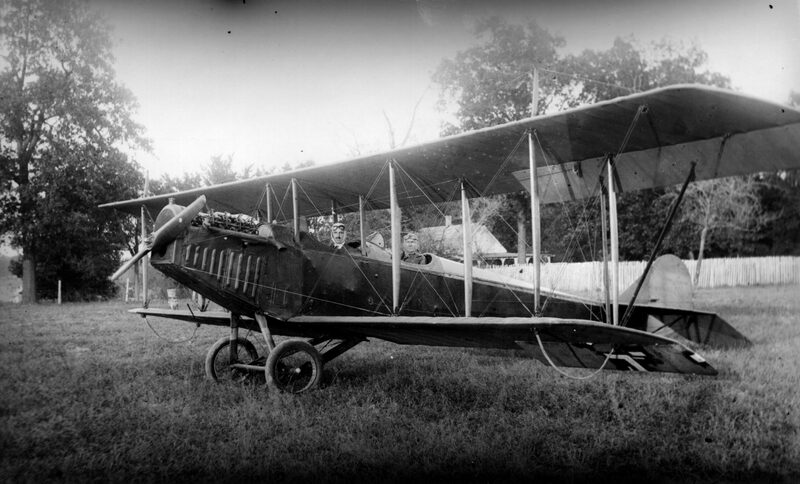 The attached photographs are early aviation photos from Mountain Home, Arkansas. In the early days of aviation, pilots, also known as barnstormers, flew their airplanes to rural communities and took passengers up for a fee. It was a way to promote aviation, and at the same time make a few dollars for the pilots. Most of the barnstorming took place during the 1920s. The airplanes were tail-wheel design, also known as tail-draggers. That particular design was conducive for landing on unimproved airstrips. Many pilots simply landed in a hay field, or any other clearing that was long enough to allow for take-offs. The first pilot to land in Mountain Home, Arkansas was pilot B.M. Lexhorn of Kansas City, President of Lightning Aviation Co. The date of his arrival in Mountain Home isn’t known, but in all probability was sometime during the early 1920s. 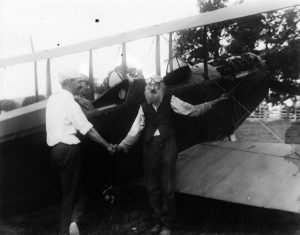 Another photograph shows Uncle Mart Holland, the first man in Mountain Home to take a ride on an airplane. Both photographs are circa 1922. Note that the pilot and passenger sit in tandem. Another piece of interesting Arkansas history. Telephones are big business in the U.S. In a 2011 article, the Washington Post presented evidence to show that the number of cellphones in this country exceeded the nation’s population. Keep in mind that the Washington Post article did not include landlines. As of 2017, a survey showed that 39% of U.S. households had cellphones and a landline. So, the total number of telephones significantly exceeds the U.S. population. There is no question that telephones are big business in the U.S. However, it hasn’t always been that way. 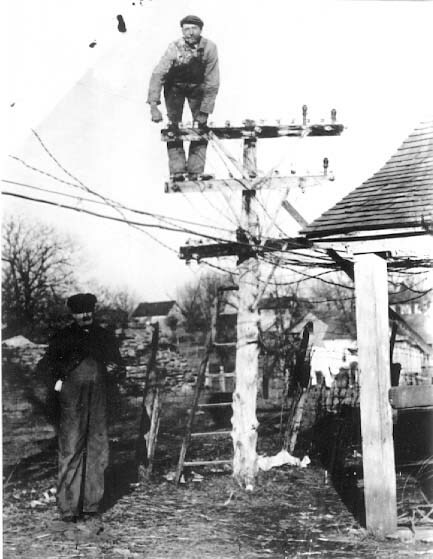 Some telephone companies started as small family owned companies. 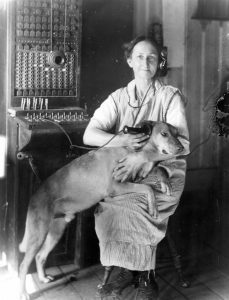 Such is the case with the Mountain Home Telephone Company of Mountain Home, Arkansas. One of the three photos below shows the owner of the company, Henry Turnbull Sr., standing on the ground, and his son, Henry Turnbull, Jr., on top of a telephone pole. Note the number of wires attached to the telephone pole. In those days (1920) there were no wireless telephones, just landlines. 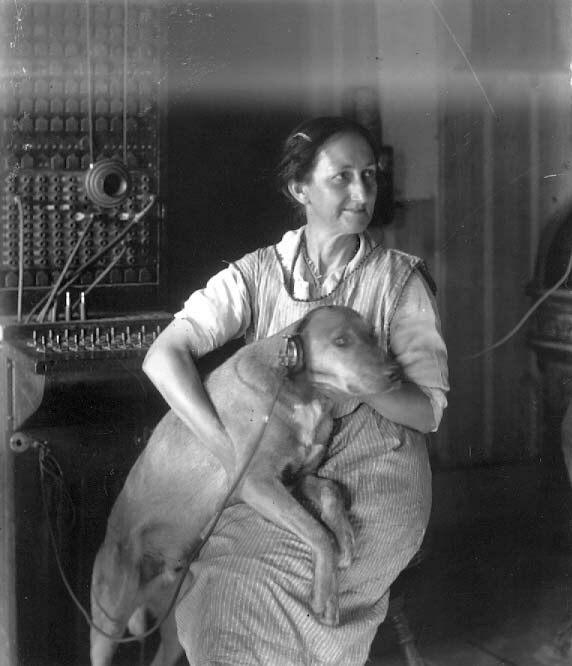 Included with the photograph described in the above paragraph, there are two photographs of Mrs. Henry Turnbull, wife of the owner, who was also the switchboard operator, and her dog, Central. Central is wearing a headset in one photograph and Mrs. Turnbull is holding the receiver up to Central’s ear in another photograph. All photographs are circa 1920. I thought everyone could use a little light-hearted Arkansas history today. PHOTOGRAPHS Courtesy of the UCA Archives and Keller-Butcher Collection. Attached is a brochure titled “Night in Little Rock” created by the Little Rock Chamber of Commerce. There are 13 images of Little Rock taken at night around 1915. There is no specific date on the brochure, but the Arkansas State Capitol building was completed in 1915 and on the back page are some statistics that include gin receipts for cotton during the 1910-1911 season. Additionally, the population shows to be 65,000. It was the 1920 census that showed Little Rock to have slightly more than 65,000. The population was only 45,941 in 1910. So, I believe the brochure was made no sooner than 1915 because of the Capitol, and was probably made before 1920. I gave it the circa date of 1915. As you will note there is a mixture of horse and buggy, automobile and trolley car transportation. There are more horse drawn carriages than there are automobiles. The horse drawn carriages also were illuminated. I thought some of you might enjoy seeing some of these century old photographs of Little Rock.